In celebration of Book Blogger Appreciation Week, I'm hosting a special giveaway. The book blogger's life isn't always easy. You see, lots of times we write posts and reviews and then, well, people may read them but they sure don't always comment. (Unless the review involves a giveaway). Oftentimes it appears that our hard work is all for naught, when actually that's not the case at all. 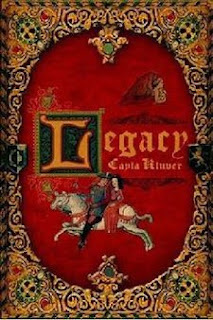 This past weekend I wrote a review for a book called Legacy by 16-year-old author Cayla Kluver. No one commented. Now it's possible you have an aversion to princesses or maybe you were all off pursuing your own knight in shining armor/lady in waiting. Or maybe not. Most likely, many of you read the review or at least glanced at it and went on to the next post, the next blog. And there's nothing wrong with that. I'm guilty of lurking as well. But, I'll share a little secret with you. I tend to pay more attention to the comments on my non-giveaway posts because the volume isn't as high. So, as a reminder to myself and others to take the time to comment more often and to encourage a little book blog comment love, here's a giveaway and a challenge. (1) copy of Legacy courtesy of AmazonEncore. To enter, read my review of Legacy and leave a comment on this post relevant to my review. • Contest ends on Monday, September 28th, 2009 at 11:59 PM CST. My preteen daughter also loves to write. I would be thrilled to have her read Kayla's book. It sounds very creative and would be a wonderful inspiration for my daughter! Oh my, a cliff hanger! Now I will have to read it. What a great review, a book that was written by a 14 year old, a romantic historical fantasy with a cliff hanger ending. Do you have any idea when the next book is coming? how long do we expect to be held on that cliff? Here's a tweet, oh and I was a little busy yesterday, it was my birthday!!! Cute idea for a give-away. I read your review. I agree that it would be great to read a book about teens actually written by a teen. And how humbling that she wrote it when she was 16! Amazing. I'm so impressed with the ability to write at all, let alone complete a novel by 16. Amazing. I'd love this. Thanks for sharing it. I left a comment on your review. The story sounds wonderful and coupled with the fact that the author herself is a teen makes this book one that I want to have in my home. As I said in the review comment, if I do not win this book, I will go and purchase. Became a Twitter follower and tweeted about the giveaway. I admit I find it hard to comment on review posts sometimes, unless I've read the book. I had to hunt through a few blogs to find a post to comment on! I commented at LiterateHousewife.com about "Time of My Life." I rarely hear about teen writers and this is very good that amazon has somewhere to promote writers in this category. I love that in the book women are held in high regard. You don't always see this. Thanks for the giveaway!! Please enter me. I liked your concise review and so impressed that this was written by a 16-year-old! I'm also fine with the story being more of a YA historical romance, it's something I would recommend to the teen! I read and commented on the review post. What an impressive accomplishment for anyone, let alone someone of her age! That sort of fantasy story really appeals to me. So I went over to Book Nut and left a comment on the Beef Princess review. That is amazing that it is writen by a 16 yearold. I think it sounds like a really good story and I would love to see how a 16 year old writes about teens. 16 years old? That just blows me away! I love these types of stories! That is such a cool thing that she wrote it at such a young age. I am amazed when a young person is able to write well and complete a novel. Wow, that' s a LONG book for a teenager to write, 464 pages! It's one of those novels with "funny" names, LOL - okay, I'll admit that I can have a hard time with those. Sounds interesting though, great contest! I like the way you described the girl's emotional confused state so well. I would LOVE to win your giveaway. I am a follower and doing BBAW. Wow, good for her! A progressive kingdom and romantic scenes as well? Sign me up. I visited Today's Adventure and left a comment on her review of Beastly. I love that the author is so young and now published through this new Amazon Encore program! What a great program to encourage writing! I'm not such a princess fan most of the time (although I have enjoyed a few princess stories in the past few years), but I'm impressed that she's so young. It reminds me of Gordon Korman, and makes me want to read some of his books again. Legacy sounds like a very interesting book. I saw it in the bookstore a couple days ago, but I had no idea that it was written by a 16-year-old. That's amazing! The plot sounds pretty cool as well. Cong on one year anniversary this month. Great review.This book sounds wonderful.Please enter me in the giveaway.augustlily06(at)aim(dot)com.Thank you. I think that's awesome that she's a teen author. I always feel so guilty when I enter a contest, because I rarely have time to acutally visit a person's blog. :/ But you're so awesome for writing that review for her, I bet she really appreciated it. Thanks for posting this up. And thanks for the contest! I definitely want a chance to read Cayla's book. It is hard for me to believe that she was 14 when she wrote this book after teaching high school students for 23 years, but then I taught math. The brutal ending really has my curiosity up and makes me really want to read this book. Great review! I am shocked at how young the author is...kudos to her for her dedication and creativity. Wow!!! A published author at age 16! Who better to write YA books than a young adult? It's nice to imagine a world where women rule and command respect (I guess I'm mainly referring to the kingdom - queendom - in her novel). I would enjoy reading a book where women rule and are highly regarded and treated with respect. I would also love to pass this book along to my teenage grandchildren. I would like them to see what a fourteen year old has written and had published! I love to read, eventhough I am a "grown up" there are some great YA books out there and I *do* read them. THis book sounds lovely, and I liked your review of it, made me wanna check it out! I am obsessed with YA literature and a hopeful high school English teacher. It is definitely nice to see something break away from the norm; while it's still a romantic book it is historical and not based in todays modern, "at-face-value" kind of romanticism. I also feel that something like this can give hope to young kids wanting to write or those who may have not thought of writing as something valuable or something interesting. I follow you on Twitter and you can find me via @JennSweepsAlot. Thanks again! It's amazing that a girl so young can accomplish so much! Your review was interesting and I would love to read this book and love to have my daughter read it too. What an inspiration this teenager is. Thank you for this giveaway and please count me in. I read your review and left a comment. I still cant believe such work was written by a 14 year old. I guess one should never underestimate the creativity and determination of our youth. I visited Sparrow review and left a comment on Enna Burning by Shannon Hale Review. That is simply amazing, to be able to complete a book by 16! Wow, that is impressive! Everyone could use a fairy tale of thier own.Also the fact that a 14 year-old wrote this book is wonderful. Keep writting Cayla. This sounds like an interesting read. I'm not personally a fan of books that are planned as trilogies (or sequels in general) since I believe that each book should stand on its own with no further reading to get full enjoyment from the time you've already spent. I do admire that a teen wrote this book. I've dreamt of publishing my own novel since grade school and it hasn't come to fruition (yet). Congrats to her, and thanks to you for this great giveaway. I would be interested to give this novel a read. This book loos sounds like it would be a great read for teenagers like my daughter. It's really remarkable that this was written by a 16 year old. It provides lots of inspiration for shiftless kids. How great that she wrote this when she was 14!!!! Amazing! I know people that go their whole lives trying to find just the right niche in life. Nice to see a teenager with her head on straight! Thanks! Great review, this sound really interesting. I'd like to read it. Agree with other posters that a 14 yr old author is an amazing thing. I'd be interested in hearing how she felt being edited.